Superpoints Reviews - Legit or Scam? 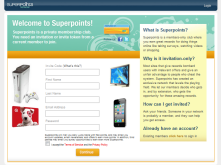 Once you sign up, you will begin receiving daily “Lucky Emails” that will give you free points, as well as newsletters, offers for more point earning opportunities, and third party survey offer that can also be completed for Superpoints. In addition, you will get daily access to the Super Lucky Button after you become a Basic level member. In order to become a Basic level member, you must recruit two new members to the website. Recruiting even more members raises your membership to level to Gold and finally Platinum, once you have recruited five new members. Your membership level determines how many times a day you may hit the Super Lucky Button. Basic members have 30 allotted hits, Gold members have 50, and Platinum members have 100. Each hit provides you with an opportunity to earn a random amount of reward points. You can also earn points by having the friends you’ve referred refer their own friends to the Superpoints Network. You will receive 25 points every time some you referred becomes a Basic level member. Your membership level is not only important to how you earn your points, but also to how you redeem your points. Basic level members need 2500 points before they can redeem them for prizes, while Gold members need 1000, and Platinum members need only 500. Free rewards networks can be beneficial, as long as you know how to earn your points efficiently and whether or not you will be able to earn enough points to reasonably redeem them for rewards. In this case, referring friends makes a big difference to whether or not the Superpoints Network will benefit you. Average Rating for " Superpoints " is 3.17 out of 5 based on 6 reviews. Superpoints is god awful. You really don't want to waste your time for less than pennies! They want you to take surveys, complete offer, watch videos 1/2 the time things don't credit and when they do its not worth much. Their Super Lucky Button is a joke. Would you like to waste your time clicking a button for nothing? Or a penny if you are lucky? If you do manage to sign up and stick around, then you will possibly get your redemption in about 45+ days, whether it be electronic or mailed gift card. Superpoints also wants you to pay them $15 to sign up for their "Platinum Membership" promising faster delivery and also referrals added to you. If you are all about promoting scams and wasting time, then Superpoints could possibly be good for you. They closed up shop years ago and re-opened again. They won't be open very long because you can only fool some of the people some of the time not all of the people all of the time. Superpoints has changed ownership. I notice this page was written in 2012, and a lot of the negative reviews came when they suddenly pulled the plug and left everyone hanging. But now the summer of 2014 they sold it and now a few of the ways of earning have changed, such as now new members get ten spins daily of the super lucky wheel. I've found I usually hit about one in three spins, anywhere from 1 to 1,000 points. At this level you can get very simple prizes. After about a week of doing spins and watching videos, I moved up to bronze level where I now get 25 spins of the wheel. If I get say, ten points on a spin, the person who referred me also wins but half, or five points. Plus at this level the prizes are a bit better, like $5 Amazon card for 10,000 points, or $10 Target card for 15,000 points. Shopping thru their site is the fastest way to earn points, and doing surveys gives lots too, but I find it annoying starting a survey only to be disqualified, so I don't do them as much. I've been at it about two weeks now, and spend about a half-hour a day, and I have 1800 points. It's easy to sit and click while watching TV. A trick I learned from watching videos, is you only need to watch for one minute to be credited. With SuperPoints I have earned over $50 consistently. I highly recommend it. I use this site and get money every week.i don't get how people are hating this site it is so easy to make money like as little as $5.i love this site. As I was reviewing my contacts I came across your email with a price of $89.00 I don't know what it's for and i never got any follow up. In fact i may have already cancelled. I am doing that right now. I want no part in this scam. And witha monthly income of $50.00 how could I possibly afford it. Could it be that sommeone else entered this (MY) information. I would like to get a response as son as possible.